We are a missional church in Endicott, NY. Our purpose is to reach more people and together grow in Christ. 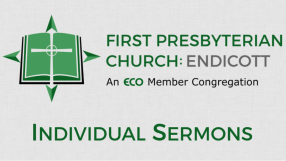 ECO: A Covenant Order of Evangelical Presbyterians is a Presbyterian denomination in the Reformed tradition. Learn, laugh and do life together with others just like you in a Small Group. No matter your age or life-stage, there's always a way to get plugged in at FPC:E! Being part of a church means doing life together. Stay current on the happenings in our community to find opportunities to connect! You can use the calendar to view details for upcoming events and to add events directly to your own digital calendar. Whether you are homebound, expecting to be away, or just checking us out, we want to be connected as a body of believers. Check out our First Pres. Press newsletter archive for more FPC:E news. Some of our kids share in their own words their decision to trust and believe in Jesus. In these pages you can find real examples of what God is doing to transform the lives of his children. As we continue to hear people's stories of faith, perseverance, God-sightings, and life-change, we will post them here for the rest of the Church to take heart in.